Tired of cold floors on those bitter winter mornings? 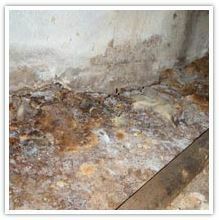 Or do your have health concerns relating to crawl space mold, mildew, dust mites or allergens? Whether you have a wet crawl space, sagging floors, a condensation problem, a moldy crawl space or wood rot – we’ll work with you to create a solution that meets the individual needs of your home and family. 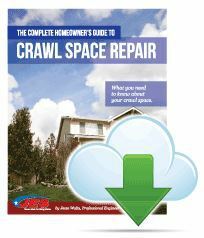 Learn how you can save yourself time and money by requesting a free crawl space inspection and receiving your FREE full-color "Homeowner's Guide to Crawl Space Repair" today! REQUEST MY FREE INSPECTION TODAY!REQUEST MY FREE INSPECTION TODAY! Cold or sagging floors, wood rot, a cracked block foundation, wet crawl space insulation, and standing water are all signs that your home’s crawl space has a problem. If left alone these problems can even lead to safety problems, like collapsed floors or rotted floor joists. 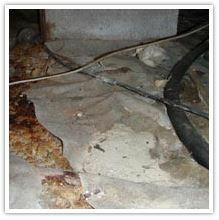 The crawl space moisture that’s causing these problems will also negatively affect your family’s health. 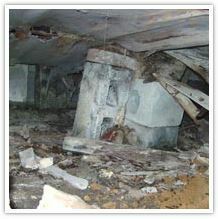 Crawl space humidity and moisture creates the perfect environment for dust mites, mold and mildew. All of these can create major health issues. When you walk through your home, do floors squeak? Do decorations and glasses rattle as you walk by? Or are the sagging floors only in one section of your home? 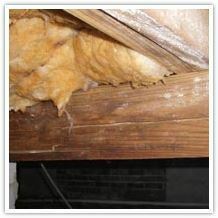 This is a sign that your home’s interior support system is not able to safely support the weight of the home above. This means that your sagging floor is more than just a sagging floor – it’s a serious safety problem! 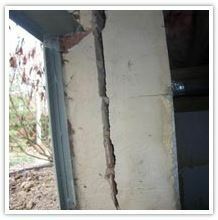 Crawl space foundation cracks can show up as a stair-step crack, vertical crack or horizontal crack. 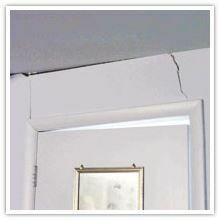 These cracks are caused by house settling. Your home will settle when the soil it’s built on can no longer support the weight of your home. Aside from poor soil preparation, moisture is the biggest player in how the soil reacts around your crawl space foundation. 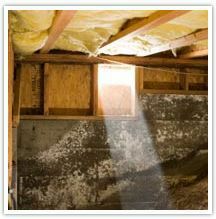 Crawl space moisture is the source of your home’s number one enemy: humidity. Crawl space humidity can be caused by loose access doors, a dirt crawl space or venting your crawl space. It’s important to know that your crawl space humidity doesn’t stay in your crawl space. The humid air circulates through your home, increasing your home’s indoor humidity which is not only uncomfortable but also invites dust mites and mold into your home, and increases energy costs. If your crawl space insulation is wet and starting to fall, that’s another sign that you’ve had a crawl space humidity problem for a long time. Is there a nasty odor coming up from your crawl space? Is your house unusually humid? Then you could have a crawl space moisture problem which could be causing wood rot in your floor joists. If the wood rot is left untreated – and the cause of it – then the wood floor joists could buckle and break, taking everything the joists supports with them. Is your crawl space vapor barrier torn? Are there puddles on the vapor barrier? Or have you installed a crawl space vapor barrier and still have a problem with high indoor humidity? 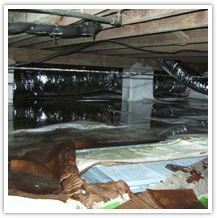 Not all crawl space vapor barriers are created equal. The crawl space vapor barriers available at most home improvement stores are very thin, like a trash bag, tear easily and don’t fix the real problem: crawl space humidity. You’ll end up spending more money replacing the cheap crawl space vapor barrier – again and again – then it would have cost to have a professional crawl space moisture solution installed. There’s been a lot of debate about the value of venting your crawl space. The original idea behind crawl space venting was that the air flow would keep your home dry. However, we now know that this isn’t true. Crawl space vents let moisture into your crawl space, and the crawl space moisture is carried through your home with the air cycle, which is also called the “Stack Effect”. The warm air in your home rises, creating suction that pulls the cool air in your crawl space up into the rest of your home. So, the humid air in your crawl space is being cycled through your home. As the crawl space humidity rises it creates a variety of problems, including wet crawl space insulation, wood root, and is the perfect environment for mold and dust mites. A moldy crawl space could be affecting your health. The mold that’s living in your crawl space could be moving up into your living space; increasing allergy and asthma problems. 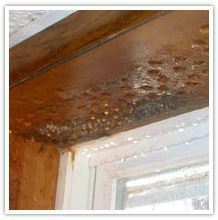 Mold loves a damp, warm space that has a food source – like wood. Sound like your crawl space? And did you know that having relative humidity greater than 55% encourages mold growth? This is also the desired humidity level for dust mites – yet another source of health problems. The support beams and floor joists in your crawl space are designed to support the weight of your home. The floor joists have to be precisely spaced otherwise you’ll have sagging or uneven floors. And if the floor joists aren’t supported properly then your floor could eventually cave in, creating even bigger problems. Problem signs like these are most often symptoms of more serious moisture issues. While most of us avoid going into our crawl space because it’s damp and nasty, it’s critical to your home’s safety and your family’s health. If you’re sick and tired of your nasty, smelly, crawl space, then you need proven, patented, affordable , long-term solutions from experts in crawl space moisture management and encapsulation, and a thorough inspection to identify the source of your crawl space problems. 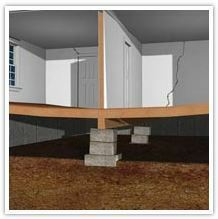 Uneven, bowing or sagging floors are caused by settling support columns or sagging floor joists. When your home is built, the support structure is designed to hold whatever is on top of it. Over time unstable soil, poor support design or waterproofing issues will damage your home’s foundation which could cause your uneven floors. 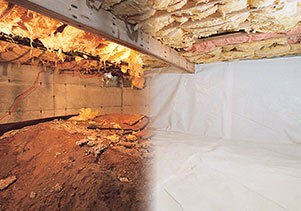 The crawl space vapor barriers available at most home improvement stores are very thin, like a trash bag, tear easily and don’t fix the real problem: crawl space humidity. You’ll end up spending more money replacing the cheap crawl space vapor barrier – again and again – then it would have cost to have a professional crawl space moisture solution installed. Stuck windows and doors are a result of house settling and can be a sign that your home’s foundation requires repair. Doors and windows can stick, swing open after being pushed shut, or have gaps around the top and bottom when your foundation is sinking. Problems such as this are normally a result of poor soil preparation during construction or inadequate drainage around your foundation. 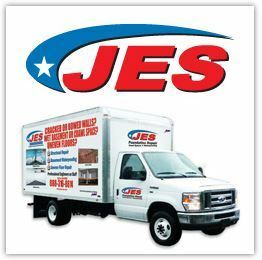 At JES, all of our crawl space repair solutions are customized for your home. When you request your free inspection, you will have peace of mind knowing that you’re dealing with crawl space experts, with over 50,000 homes repaired in the Mid-Atlantic region since 1993 and Professional Engineers on staff. You can rest assured that if you do have a crawl space moisture problem, we have the patented, proven solutions to fix the issue for good. Need immediate help? Call us at 888-240-8494 today! The JES Crawl Space Dehumidifier air system is a compact crawl space dehumidifier that is designed to fit in even the tightest spaces. 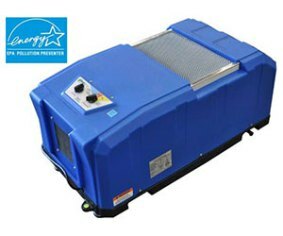 The compact crawl space dehumidifier will dry up to 6,000 square feet and will automatically drain the water – so you don’t have to worry about emptying it! And best of all, it’s cheap to run and even filters out mold spores and dust. JES crawl space sump pump system are available in several sizes and configurations, depending on if the application is for a crawl space, moderate seepage in a basement, or a more serious flooding issue that requires industrial strength support. CrawlSeal™ is a 20-mil thick liner – similar to a pool liner – that protects your crawl space from moisture, mold and mildew. CrawlSeal™ encapsulates your crawl space; covering the floor, walls and surrounding any pipes or beams. Once installed, CrawlSeal™ will prevent water vapor from entering your crawl space from the floors and walls, saving you money on heating and cooling costs. 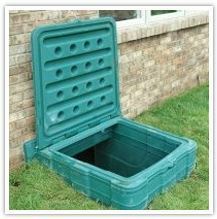 The liner is so tough that once it’s installed, you can use your crawl space for storage! And CrawlSeal™ has a 25 year warranty against wear and tear. 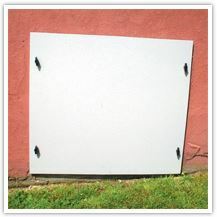 Crawl Space Doors are tough, weather proof crawl space access door that’s installed in the same spot as your current crawl space door. Our Crawl Space Door is easy to install, built to last and will never rot or rust and is waterproof and resistant to mold growth. 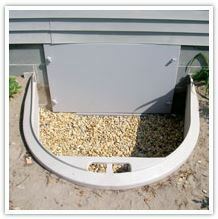 CrawlSeal™ Crawl Space Vent Covers are installed over your crawl space vents and keep outside air out of your crawl space. 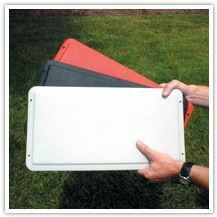 The vent covers are available in three colors and are built to last. The durable plastic never needs to be painted and you don’t have to worry about the vent cover rotting or rusting. The Turtl™ Access Door is the solution to ugly, unsafe, below grade crawl space access doors. The Turtl™ is made of a durable plastic that will withstand the seasons without worry of rot or rust. 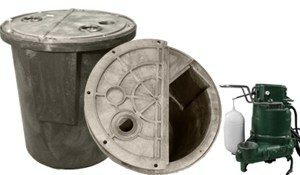 It’s available in three colors so you can choose the color that works best with your landscape and home. Floor gaps, wall gaps and gaps between your floor and baseboards are a sign that you have sagging floor joists or your house is settling. Both of these problems are safety hazards and, if left unfixed, will cause additional damage to your home. If You Don't Need Repairs, We'll Tell You! At JES, all of our crawl space repair solutions are customized for your home. When you request your free inspection, you will have peace of mind knowing that you’re dealing with crawl space experts, with over 70,000 homes repaired in the Mid-Atlantic region since 1993 and Professional Engineers on staff. Don’t Wait! Get Your Free Inspection Today! Take the first step to a dry, comfortable basement by requesting your free, no obligation inspection (a $399 value) by a professional crawl space repair expert at JES today! 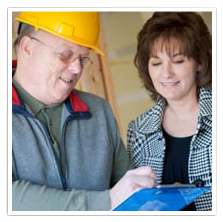 Our experts will evaluate your individual needs and propose a solution tailored to you and your home. And remember, we’re consultants…not salesmen! We’re here to help! Rather talk to a live person? Give us a call at 888-240-8494! From our experience, we know that often times crawl space repair problems are interrelated with basement waterproofing and foundation repair issues as well. That’s why JES offers proven solutions for all of these issues, giving you a complete menu of repair options for your entire home. REQUEST MY FREE INSPECTION TODAY! © 2017 JES Construction. All Rights Reserved. Legal. Privacy.